WHETHER I’M SENT A PRODUCT FREE OF CHARGE OR HAVE PURCHASED IT MYSELF, ALL OPINIONS ARE MY OWN. SAMPLE PROVIDED BY CORAZONAS. Allow me to introduce you to one of my favorite new snacks to have on the go! 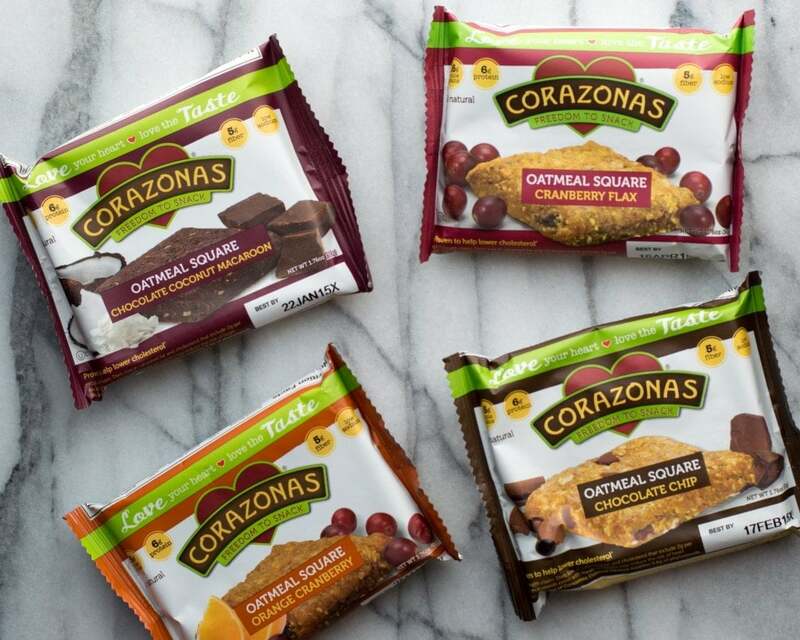 Corazonas Oatmeal Squares are filling, delicious, and pack a good dose of fiber and protein. I came across these tasty energy bars in the middle of a very busy week, and they saved me more than once. If your schedule requires you to pack lunch and/or dinner sometimes, you know how it feels to be stranded without a snack to get you through the afternoon! I’m not usually a big fan of packaged energy bars, but these make the cut for sure. They taste like a soft, chewy oatmeal cookie, and clock in at 180 or 190 calories, depending on the variety. My favorite was the Cranberry Flax, which got a nice extra crunch from flaxseed meal. The bars are less sugar-forward than your average cookie, but they’ve definitely got enough sweetness to feel like a treat. If you’re up on your etymology, you may have noticed that the name of these bars sounds a lot like the word for heart in many languages. This is no accident — the bars contain a dose of plant sterols, a heart-healthy ingredient. While I can’t say I noticed a difference in my heart health as a result of eating these snacks (and do not have any health issues in that arena to begin with), Corazonas does provide clinical studies to back up their health claims. Plant sterols or no, I’m sold on the taste of these bars, and happy to have a new go-to snack in the energy bar aisle when an afternoon pick-me-up is in order.